Last reviewed by Editorial Team on August 26th, 2018. L-Carnitine or levocarnitine is a quaternary amine compound which is naturally synthesized from the essential amino acids methionine and lysine and it is essentially involved in metabolism of most mammals, plants and some bacteria. Although it’s often classified as an amino acid, the chemical structure of L-carnitine is slightly different from the exact amino acids moiety and it is roughly more similar to the structure of choline. It can be taken through the diet and best sources of l-carnitine are red meat and dairy products. It can be also produced synthetically and taken as a dietary supplement. Synthetic carnitine is a racemic mixture of both D and L isomers; however, only L-carnitine is physiologically active thus it should be always manufactured in L-form. L-carnitine is considered as a vitamin like and amino acid like substance. Some studies have been shown beneficial effects of L-carnitine for obesity, glycemic control, anti-oxidant effects and exercise. Some studies support its use for heart issues such as: angina, heart failure and states after heart attack. However, newest studies advise that high concentrations of L-carnitine may actually provoke heart problems. There are also claims that it neutralizes free radicals that damage DNA and genetic material in your cells. Potential benefits of L-carnitine may also include: Alzheimer’s disease and dementia, Peyronie’s disease, diabetic neuropathy, low sperm count, and erectile dysfunction. However more relevant and bigger studies are needed to confirm all of these benefits. Therapeutically, L-carnitine can be used to stimulate gastric and pancreatic secretions and in the treatment of hyperlipoproteinemias. What is carnitine function in the body? 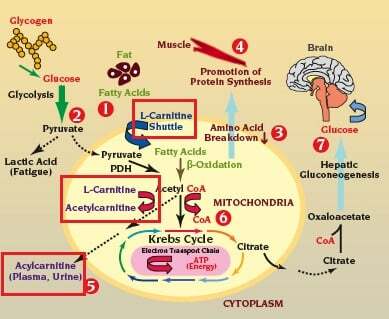 Carnitine main function in the body is metabolic (catabolic) lipid oxidation facilitation. It works as a transporter of long-chain fatty acids into the cell to the mitochondrial area where they are being metabolized via metabolic reaction called β-oxidation. Before beta-oxidation, fatty acids are changed into acyl-CoA and since this compound is not able to pass cell walls, carnitine comes with its role as a transporter. Therefore, without carnitine, most lipids cannot be metabolized and used as an energy source so our body would start to accumulate fatty-acids which will result with obesity. In humans, kidneys and liver produce carnitine. Carnitine synthesis begins with methylation of the amino acid L-lysine by S-adenosylmethionine (SAMe). Vitamin C, magnesium, iron, vitamins B3 and B6, and alpha-ketoglutarate, plus cofactors required for creating SAMe such as: methionine, vitamin B12, folic acid and betaine are all needed for endogenous carnitine synthesis. Enzymes located in the inner and outter mitochondrial membranes (carnitine palmitoyltransferase and carnitine acylcarnitine translocase) are responsible for synthesis, translocation, and regeneration of carnitine. In blood, carnitine is present in the free form or as an acyl-carnitne and does not need transport proteins. Carnitine is stored predominantly in skeletal and cardiac smooth muscles, but it is also found in plasma however in much lower concentrations. When taken as a supplement, L-carnitine is absorbed in the small intestinal through the sodium-dependent active transport or rarely by passive transport. The human pool of carnitine is approximately 20g with 98% within the cardiac and skeletal muscle pool, 1.4% in the liver and kidney, and 0.6% in extracellular fluid. L-carnitine is chemically known as L-3-hydroxytrimethylamminobutanoate. It belongs to the class of organic compounds known as carnitines. These are organic compounds containing the quaternary ammonium compound carnitine. Most common brand names for L-Carnitine are: Carnitor, Carnitine-300, Carni Fuel, Mega L-Carnitine, Maximal Burner Carnitine, Proxeed. Pharmacokinetic studies showed that L-carnitine is absorbed in the small intestine by a combination of active transport and passive diffusion. Bioavailability after oral administration may vary from as low as 16-18 % to as high as 54-87 %. L-carnitine oral supplementation in doses greater than 2 g do not offer any advantage, because of the saturation of carnitine’s absorption at this dose. Maximum L-carnitine’s concentrations in blood are reached about 3.5 hours after an oral dose is taken, with an elimination half-life of about 15 hours. Elimination of L-carnitine is primarily via the kidneys. The skeletal muscle, heart, liver, kidneys, and epididymis are locations where L-carnitine should be accumulated and express its major functions. Despite results indicating increased plasma and urine concentrations of free carnitine and its metabolites after oral dose, no significant change in red blood cell carnitine cocnetrations was noted in healthy subjects, proposing either a slow repletion of tissue stores for carnitine following or a low capability to transport carnitine into tissues under normal condition when it is taken orally. What are FDA approved indications for L-Carnitine? L-Carnitine should be administered intravascular to symptomatic patients because of the poor bioavailability after oral administration. The highest amounts of L-carnitine are found in red meat. It can be also found at considerably lower amounts in many other foods including: pumpkin, sesame, sunflower, beans, peanuts, peas, lentils, artichokes, asparagus, beet greens, collard greens, broccoli, brussels sprouts, garlic, mustard greens, okra, parsley, kale, apricots, bananas, buckwheat, corn, millet, oatmeal, rice bran, rye, whole wheat, wheat bran, wheat germ, bee pollen, brewer’s yeast, carob, etc. Average person intakes 20-200 mg of L-carnitine per day with regular diet, whreas strict vegetarian or vegan may ingest as little as 1 mg/day since they don’t eat red meat which is the main source of L-carnitine. However, studies showed that even vegans exhibit no signs of carnitine deficiency, despite the fact that most dietary carnitine is derived from animal sources. Gastrointestinal side effects: nausea and vomiting, gastritis, and taste fatigue. Very rare and in predisposed patients such as those on hemodialysis, L-Carnitine may cause: diarrhea, abdominal pain, anorexia, constipation, dyspepsia, gastrointestinal disorder and melena. Gastrointestinal side effects are generally mild and have been reported in almost 41% of patients. Decreasing the dosage and taking medicine with food may decrease GIT side effects, but may also lower bioavailability. CNS side effects: There are some reports of seizures in patients with or without preexisting seizure activity, and increases in seizure attacks rates and/or severity in patients with preexisting seizure activity. In chronic hemodialysis patients, L-carnitine may cause: anxiety, dizziness, hypertonia, insomnia, paresthesia and vertigo. Cardiovascular side effects: Although rare, intravascular doses in predisposed patients may cause: arrhythmia, atrial fibrillation, cardiovascular disorder, angina, ECG abnormalities hemorrhage, hypertension, hypotension, palpitations, tachycardia and vascular disorder. Other side effects: Fever, body odor, depression, dizziness, impaired vision, loss of appetite or weight, swelling in hands, lower legs, and feet, tingling sensation and weakness have been also reported however very rare and minor. There are also very rare reports of rash and hypothyroidism. L-Carnitine has been assigned into pregnancy category B by the FDA pregnancy list of drugs which means that: “Animal studies have failed to reveal evidence of fetotoxicity or teratogenicity. There are no controlled data in human pregnancy”. Thus L-Carnitine is only recommended for use during pregnancy if benefit outweighs risk. There are no evidences on the L-carnitine excretion into human milk. Animal studies showed that L-carnitine concentrations in milk are increased in dairy cows after exogenous use. The risks to the infant from excess L-carnitine intake should be weighed against the benefits of L-carnitine supplementation to the mother. Although L-carnitine is supplied with food intake and can also be synthesized endogenously, data suggest both primary and secondary deficiencies may occur. Carnitine deficiency is most commonly acquired or a result of inborn errors of metabolism. Pre-term born babies are at increased risk for developing L-carnitine deficiency because of impaired synthesis and insufficient renal tubular reabsorption. L-carnitine deficiency in infants results in cardiomyopathy, congestive heart failure, hepatomegaly, encephalopathy, impaired growth and development and neuromuscular disorders. Primary carnitine deficiency is very rare conditions characterized by: low plasma, erythrocytes and tissue concentrations of carnitine, and is presents with symptoms such as: cramps, muscle fatigue and myoglobinemia following exercise. Additional symptoms of chronic primary carnitine deficiency may include hypoglycemia, hypotonia, progressive myasthenia or lethargy. Typical pathological manifestations of chronic L-carnitine deficiency may include neutral lipid accumulation within skeletal muscle, cardiac muscle, and liver, muscle fibers disruption and an accumulation of large aggregates of mitochondria within smooth and skeletal muscle. Whenever our body needs energy the VLDL and chylomicrons release fatty acids which are then transferred to the cell with the help of L-Carnitine where they will be metabolized as a good source of energy. 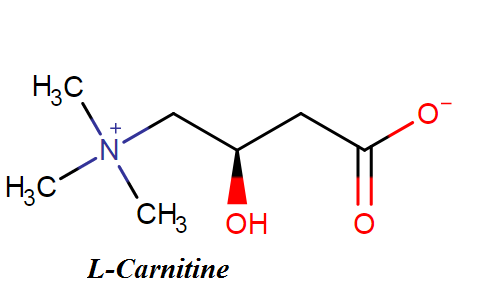 L-Carnitine acts as a transporter to the metabolic location. It has been shown that obese patients don’t poses enough amounts of L-carnitine proportionally to the fats they intake. That may be the reason why obese patients easily lose energy during physical activity. Many health professionals share opinion that L-Carnitine supplementation is helpful for fatty acids transfer to the muscle for production of energy. A Comparative Study in Chennai and Tirupathi showed that when L-Carnitine was taken as a dietary supplement by overweight and obese patients it reduced their weight. However, this worked only when obese person also did physical activity. Study also noted that obese and overweight patients who were doing regular physical activity required additional L-Carnitine for the transport of fatty acids which were used for energy production. It has been also shown that experimental group with patients younger than 30 lost more weight when given L-Carnitine supplement than among the control group. The reason could be that after the age of 30 the endogenous synthesis of L-Carnitine declines. More large-scaled studies are needed to confirm L-Carnitine benefits for obesity. L-carnitine supplementation in doses of 2-3 g daily resulted in improved lipid profiles in patients with hyperlipidemia reducing total plasma LDL-cholesterol and increasing plasma apolipoprotein A-1 and B levels. Lipid levels normalization was specifically observed after 1 year supplementation. It has been also showed that L-carnitine was able to decrease triglycerides levels in patients with essential hypertension. Positive results were also found in hypercholesterolemic patients with newly diagnosed type 2 diabetes, with significant reductions in Lp(a) levels noted after 3 and 6 months of 1 g L-carnitine use twice daily. Different studies have observed the effectiveness of L-carnitine when taken as supplement in the management of cardiac ischemia and peripheral arterial disease. Since it has been shown that patients with these conditions have reduced levels of carnitine, supplemental amounts might counteract the toxic effects of free fatty acids and improve carbohydrate metabolism Thus, when taken orally or as an injection, L-carnitine showed anti-ischemic and cardiovascular benefits. One relevant, placebo-controlled, double-blind, multicenter clinical study was conducted in Italy on 2,330 participants with acute anterior myocardial infarction. Patients in treatment group were receiving L-carnitine intravascular 9 g/day for 5 days and then then 4 g/day orally for 6 months. Studies revealed that intravascular treatment with L-carnitine significantly lowered mortality rates even after 5 days of initiation, but did not considerably reduced the risk of heart failure or death at 6 months. One meta-analysis study combined the results from this and 12 smaller trials. Overall results showed that L-carnitine reduced mortality by 27%, ventricular arrhythmias by 65%, and angina by 40% during the 2 months, but does not reduce the risk of heart failure or recurrence of myocardial infarction in patients experiencing an acute myocardial infarction. Patients with peripheral arterial disease may develop claudication that will result with inadequate supply of oxygen-rich blood to the legs leading to the accumulation of acetylcarnitine in muscle due to its inadequate utilization. Patients with diagnosed peripheral arterial disease who develop claudication have significant issues to perform exercises and have problems with difficulty walking even for short distances at a slow speed. Findings showed that L-carnitine may reduce these issues. One multicenter clinical study showed that supplementation with L-carnitine at doses of 2 g per day during 12 months significantly improved exercise performances in patients with moderate-severe claudication. Another study found that when L-carnitine was taken for 6 months in individuals with disabling claudication, their walking distance and speed, enhanced physical function, reduced body pain and overall health state was improved. According to these studies, it has been proposed that when L-carnitine is administered for up to 1 year, it might have beneficial effects on the cardiovascular system health. L-carnitine supplementation in oral doses of 900- 3,000 mg per day has been shown to reasonably improve tolerance to exercises and reduce ECG abnormalities of ischemia in patients with stable angina. It has been estimated that almost 1/4 of patients might become angina-free during L-carnitine supplementation. Increasing benefits were showed after long-term supplementation. Cardiovascular functional improvements such as: reduction in the number of premature ventricular arrhythmias during rest, reduction in ST-segment depression during maximal effort and increase in maximal systolic arterial blood pressure have been also noticed. Moreover, increase in the number of patients belonging to class I of the NYHA classification (as opposed to classes II and III) and a dose or general reduction of cardioactive drugs has been also reported. Improvements in exercise and hemodynamic parameters have been desribed when L-carnitine was used in doses of 1g three times a day during 4 months in addition to the prescription drugs such as: digitalis, beta-blockers, calcium antagonists and nitrates. Studies showed when L-carnitine was used in doses of 2 g per day for the treatment of heart failure caused by dilated cardiomyopathy, improvements in survival rate, Weber classification, ejection fraction, maximal time of cardiopulmonary exercise test, arterial and pulmonary blood pressure, peak VO2 consumption, and cardiac output was noticed. There are case-reports that L-carnitine supplementation during cardiogenic shock improved metabolic acidosis and therefore survival rates in hospitalized patients. However, one recent research raised concerns about potential L-carnitine cardiovascular toxicity after chronic exposure. This study discovered that L-carnitine is metabolized by intestinal microbiotia to the proatherogenic substance trimethylamine-N-oxide (TMAO), related with increased cardiovascular disease risk. This study also found dose-dependent connection between fasting plasma L-carnitine amounts and risk of provoking coronary artery disease, peripheral artery disease, and overall cardiovascular disease, but only among patients who have high TMAO levels. According to this finding it could partly be explained the link between high levels of red meat consumption and increased cardiovascular disease risk. More studies are needed to fully conclude the effects of L-carnitine on cardiovascular health. Some athletes administrate L-carnitine to improve their performance. However, it is questionable whether L-carnitine use really has positive impact on sport performance. Some studies showed benefits some not. One clinical study stated improved running speed and decreased average use of oxygen and heart rate during prolonged L-carnitine supplementation, while other studies reported increased maximal uptake of oxygen and decreased levels of plasma lactate when L-carnitine was taken 1 hour before the exercise. One small study on L-carnitineʼs effect on high-repetition squat exercise found significant benefit from 2 g L-carnitine daily use for blood parameters of muscle recovery such as: creatine kinase, myoglobin and malondialdehyde. But, other research found no special benefits of L-carnitine supplementation for sports performances at doses ranging from 2–6 grams per day taken during 28 days. According to this study, L-Carnitine supplements do not appear to increase the body’s oxygen use or improve metabolic status during exrcises, nor do they necessarily increase the amount of carnitine in skeletal muscles. Insulin resistance plays major role in diabetes type 2 development and may be related with a defect in beta oxidation of fatty acids in muscle cells which goes in favor to the theory of diabetes type 2 development due to mitochondrial dysfunction. It is also known that increased storage of fat in lean tissues is important marker for insulin resistance. Early findings suggest that intravascular L-carnitine may improve insulin sensitivity in patients with diabetes type 2 by reducing the amounts of fats in muscle cells and may also lower glucose plasma levels by increasing its oxidation in cells. Additionally, 2 studies revealed that treatment with acetyl-L-carnitine in doses of 3 grams per day orally, during 1 year, for either type 1 or type 2 diabetes patients provided important nerve pain relief and improved vibration perception in patients with diabetic neuropathy. The best results were achieved in patients with type 2 diabetes of short duration. Animal studies showed that L-carnitine’s effectiveness for ethanol-induced fatty liver, however clinical benefits in humans are lacking. Selimoglu MA et al study found that levels of plasma carnitine were considerably lower in children with diagnosed chronic hepatitis B than in healthy controls. Also, carnitine concentrations corresponded inversely to extent of liver inflammation and fibrosis. One study also described benefits of L-carnitine when it was used in doses of 2g twice a day during 60 days in 120 patients with hepatic encephalopathy caused by liver cirrhosis. Serum ammonia concentrations were significantly lower 30 and 60 days after its administration. Mental function was also significantly improved by L-carnitine. Many researchers believe that L-carnitine is able to reduce brain and blood ammonia levels through stimulating ureagenesis. L-carnitine has been widely studied for patients with renal failure and hemodialysis. Many patients with end-stage renal disease, particularly those on hemodialysis, become carnitine insufficient. It has been found that oral or IV supplementation alleviates some of the systemic disorders related with dialysis, such as: renal anemia, insulin resistance, lipid abnormalities, cardiac dysfunction and oxidative stress. Intravascular administration of L-Carnitine during 8 months 3 times a week resulted in improved left ventricular ejection fraction. In addition, The National Kidney Foundation – KDOQ initiative recommends the use of L-carnitine for the treatment of anemia related with chronic kidney failure. Many patients with cancers are deficient in carnitine levels. It has been suggested that fatigue resulting from chemotherapy or radiation treatment, and poor nutritional status may be caused by low creatinin levels. In one study, supplementation with high doses of 4g per day of L-carnitine supplements during 1 week reduced symptoms of fatigue in most patients on chemotherapy and restored normal blood levels of carnitine. Another trial showed that terminal cancer patients experienced less fatigue and improved mood and quality of sleep during L-carnitine therapy. In both studies, most subjects were carnitine deficient before taking the supplements. Patients with chronic fatigue syndrome (CFS) have lower levels of free carnitine in blood, total carnitine, and acyl-carnitine compared to healthy individuals. One crossover study treated 30 patients with CFS with L-carnitine or amantadine. Carnitine supplementation resulted with improvement in 12 of 18 parameters during the study. HIV-infected patients are known that accumulate fat in some parts of the body while on other hand they lose fat in others and may develop hyperlipidemia and insulin resistance, leading to lipodystrophy syndrome. This syndrome may lead to mitochondrial dysfunction with carnitine deficiency and proper fat metabolism. The true mechanism is not yet fully understood. Although findings are conflicting, intravenously or orally supplementation with L-carnitine at doses of 2–6 grams per day for some weeks or months in HIV-infected patients may slow the reduction of lymphocytes levels and thus HIV progression. L-carnitine may also reduce neuropathy and may beneficially affect blood lipid levels. The carnitine amounts in seminal fluid is directly associated with spermatozoid count and motility, proposing that this amino-acid-like vitamin might be of great value in treating male infertility. Costa et al and Vitali et al studies described that carnitine supplementation in doses of 2–3 grams at daily basis during 3–4 months may improve sperm quality and one randomized, double-blind study found that 2 grams per day of L-carnitine supplementation dring 2 months by increased the concentration and both total and forward motility of sperm in 100 infertile men. Those benefits may be related to the increased mitochondrial fatty-acid oxidation which gives more energy to spermatozoids and reduced cell death in the testes. However, one, recent randomized and small study conducted on 21 infertile men found that 3 grams per of L-carnitine taken for 6 months produced no significant increases in total motile sperm counts or sperm motility. Larger studies are needed to confirm this potentially very effective treatment. Can L-Carnitine increase life-span and slow down aging process? Mitochondrial dysfunction is supposed to contribute to the aging process. It is also known that carnitine concentration in tissues declines with age and thus reduces the mitochondrial membrane integrity. Animal studies on aged rats found that supplementation with high doses of acetyl-L-carnitine and alpha-lipoic acid were capable to reduce mitochondrial decay. The animals also had better cognition and memory tasks. For now, there are no equivalent studies in humans. But, there were some positive findings after L-carnitine supplementation in adults with mild cognitive impairment and Alzheimer’s disease when used in doses of 1.5–3.0 grams per day during 3–12 months. L-carnitine is suggested to work as peripheral antagonist of thyroid hormone in some tissues. One study showed that when L-Carnitine was used in doses of 2-4g per day it prevented and reversed hyperthyroidism symptoms, including utilizing a beneficial effect on bone mineralization. Coadministration of L-carnitine and adenosylcobalamin in patients with diagnosed anorexia nervosa has been shown to normalize gastrointestinal function, speed up body weight gain, decrease fatigue, and improve physical performance. Giordano C et al study showed that children with infantile anorexia responded to a combination of carnitine and adenosylcobalamin with increased appetite. A coadministration of L-carnitine in daily doses of 4 g during 5 days and betamethasone in women in the prenatal period reduced the risk of both the respiratory distress syndrome and the mortality of premature newborns. However, L-carnitine supplementation in preterm infants at a doses of 15-30 mg/kg per did not result in adequate outcomes for frequency of apnea, weight gain, or length of hospital stays. It appears that prenatal supplementation with L-Carnitine may be more beneficial than newborn supplementation. Most forms of age­ associated memory and cognitive issues and conditions are closely linked to mitochondrial dysfunction in the central nervous system. That provides a great opportunity for therapy with a mitochondrial enhancer such as L-carnitine. Most neurodegeneration studies used the acetyl-­L­-carnitine for investigation. The influence of acetyl­-L-­carnitine is particularly important in Alzheimer’s disease, as the one of leading cause of dementia and mild cognitive impairment worldwide. One recently study showed that acetyl­-L­-carnitine supplementation at daily basis for a year led to improvements on the cognitive symptoms patients with AD younger than 61. More recent studies have shown good effects even in older patients, but, as with all forms of prevention, the earlier you start using L-carnitine, the more powerful the effects on memory. Doses ranging from 1.5 to 3 grams per day of acetyl-­L­-carnitine have regularly been shown to produce effects several­ fold greater than placebo alone, with the greatest influence in patients who are at beginning stages of the disease. Improvements can be seen as early as 3 months, and continue to increase over time. Most of benefits after L-carnitine use are associated to the mitochondrial protective properties. Scientists can induce Alzheimer’s­-like modifications in neurons using a diversity of chemical methods, and they consistently find that treatment with acetyl-­l­-carnitine improves mitochondrial function and slows down the development of those changes, including accumulation of the “Alzheimer’s protein” called amyloid beta, the best known marker of Alzheimer disease. Even after dangerous amounts of amyloid beta plaques in brain tissue, acetyl-­L-­carnitine treatment decreases its impact. Animal studies conducted on animals with conditions similar to Alzheimer’s disease have been shown improved memory and learning abilities when treated with acetyl­-L­-carnitine. What is the maximal daily dose of L-carnitine I can take? If taken in doses of 3 g per day, carnitine supplements may cause: nausea, vomiting, diarrhea, abdominal cramps, and a “fishy” body odor. Rare cases of muscle weakness in uremic patients and seizures in those with seizure disorders have been also reported. Can I take L-carnitine and Warfarin together? There are some reports that L-carnitine may potentiate the hypoprothrombinemic effects of warfarin and other oral anticoagulants from coumarin class. The mechanism of interaction is still unknown. There have been some isolated case reports of INR increase and/or hemorrhage in patients treated with warfarin following the addition of L-Carnitine therapy. After discontinuation of L-carnitine, INR levels returned to normal. If you are using warfarin with L-carnitine supplements, you should seek immediate medical attention if you experience any unusual bleeding or bruising, or have other signs and symptoms of bleeding such as dizziness; lightheadedness; red or black, tarry stools; coughing up or vomiting fresh or dried blood that looks like coffee grounds; severe headache; and weakness. It is important to tell your doctor about all other medications you use, including vitamins and herbs. Do not stop using any medications without first talking to your doctor. Anticonvulsant drugs such as phenobarbital, valproic acid, phenytoin, and carbamazepine, have a significant lowering effect on L-carnitine levels. The antibiotic pivampicillin negatively impacts L-carnitine metabolism. L-carnitine should be used carefully with pentylenetetrazole and potential drug interactions should be monitored, since evidence suggests the combination might exacerbate the side effects of the drug. There are also reports that L-carnitiine may prevent cardiac toxicity secondary caused by Adriamycin. When used together with Zidovudine, L-carnitine may prevent the drug-induced destruction of myotubes, prevent the accumulation of lipids by preserving the structure and volume of mitochondria. L-carnitine supplementation may be effective in prevention of the elevation of liver enzymes, myalgia, weakness, and hypotension caused by isotretinoin. Emetine may promote carnitine deficiency. A case report suggests carnitine deficiency may be induced in patients receiving pyrimethamine and sulfadiazine. A deficiency of vitamin C may decrease endogenous synthesis of carnitine in human body. In guinea pigs, Vitamin C supplementation increased carnitine biosynthesis. A case report studies also described normalization of carnitine levels in the body after following administration with riboflavin. In rats, supplementation of vitamin B12 increased biosynthesis of carnitine. Choline supplementation, however, appears to decrease carnitine synthesis. What are best L-carnitine supplements? Why does brain need essential fats?